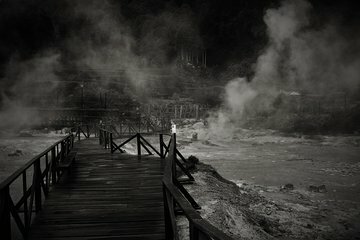 Spend time admiring the natural outdoor beauty of Furnas on this Hot Springs half-day tour. You won’t have to worry about getting lost on unmarked countryside roads, as round-trip transport is included, and your guide will navigate. Save time waiting in visitor lines, as admission tickets are provided. Get access to the Furnas Lagoon, Terra Nostra Botanic Gardens, the fumaroles, and much more. This tour was great. Leon the guide was one of the best guides I've had. His knowledge of the island and it's customs was fantastic. Nothing was too much trouble for him. I like that the tour was half day as well, if your on a busy schedule you can still see so much in the allocated time. I highly recommend this tour. The guide was 40 minutes late, but besides the rough start-- the sights and information made up for it! It was breathtaking and I thought it was much better than the sete cidades tour because of the sights. The guide was friendly and very very educated about every plant, history, word, etc. This was a fantastic day. The guide was thorough, group was a good small size, and I really feel like we got to see both the tourist side and cultural side of Furnas/the surrounding area. I ended up getting on to a full-day tour that included a stop at the thermal pools - so worth it to go for the full-day if you have the time! When I go back to Azores, I will definitely use this group again! Very good trip and driver was excellent. His recommendation for restaurant was great. Highly recommend this tour. Our tour of Furnas was spectacular. Leon, our guide, was excellent and very professional as he took us to the tea factory and the hot springs of Furnas. We saw amazing sights of the countryside and spent some time with our feet in the hot springs. Leon was a wealth of information and shared his knowledge with us about Sao Miguel. This was one of our favorite tours! !